See, this is what happens when Sam has too many striped shirts – I run out of names and start insulting them (and look how angry/sad that makes Sam!). This shirt is striped in different browns, some of which have little dots along the way. It does up with diamond snaps. The shirt has two breast pockets that do up with two diamond shaped snaps each. It’s once again a western-cut. In The Magnificent Seven (3x01), Sam wears this shirt from the stake-out of the bar until the end of the episode. In Time After Time (7x12), Sam is wearing this shirt when Sheriff Mills calls and wakes him up to tell him and Dean about a possible job. In Party On, Garth (7x18), Sam wears this shirt at the end of the episode when he and Dean say goodbye to Garth. 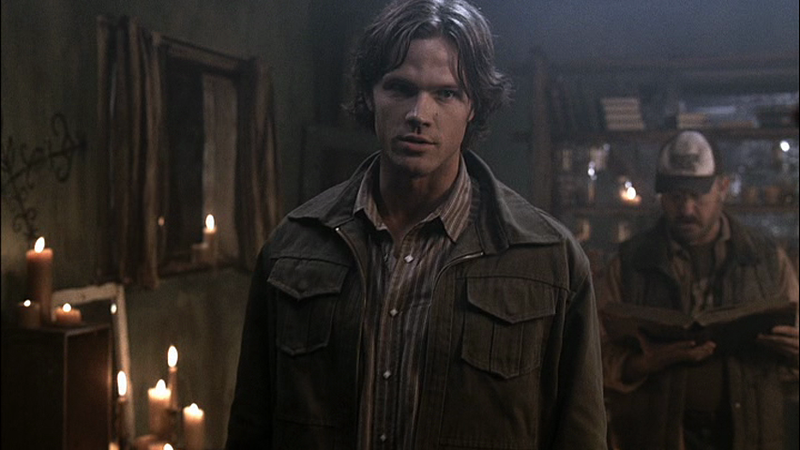 In Heartache (8x03), Sam wears this shirt while researching in the motel room after Dean comes back from seeing the doctor about the guy who gauged out his own eye. In Dog Dean Afternoon (9x05), Sam wears this shirt at the very end of the episode when he and Dean talk before driving away. In Mother’s Little Helper (9x17), Sam wears this shirt at the end of the episode when he says goodbye to (Sister) Julia Wilkinson. 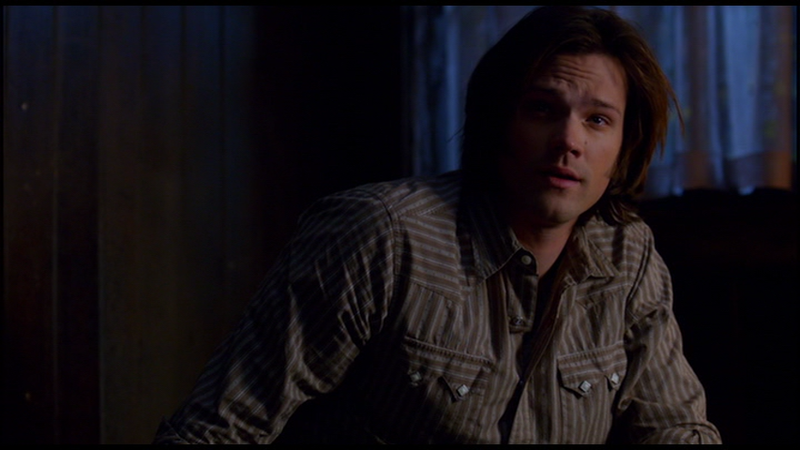 In Paper Moon (10x04), Sam is wearing this shirt as the episode begins while he and Dean are on vacation. He briefly takes it off to wear a costume and talk to the sheriff’s department, but then puts it back on again when he and Dean go to the barn and find Kate. 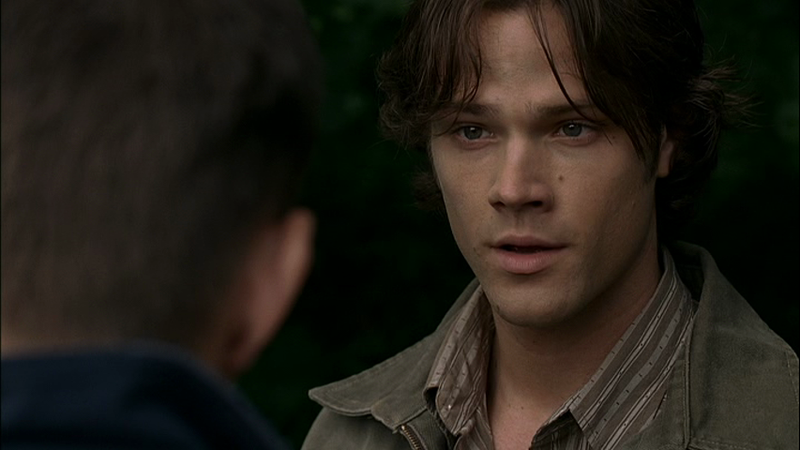 In Baby (11x04), Sam wears this shirt when he helps Dean wash the Impala at the beginning of the episode. In Celebrating the Life of Asa Fox (12x06), Sam is wearing this shirt when they show up at Jody’s, he keeps it on until they leave for the wake.